For the Sonic Drift 2 level, see Emerald Hill (Sonic Drift 2). Emerald Hill Zone is the first zone in Sonic the Hedgehog 2, and is the analogue of Green Hill Zone. It fills the Tropical Island theme for the game. The zone contains bridges, waterfalls, loops, and flowers like the standard Green Hill Zone. However, it doesn't have totem poles. It introduced a new corkscrew path feature, which became a token symbol for the game, and was later reused in future levels such as Sonic Advance 2's Leaf Forest. There are enough checkpoints in the two acts of this zone that it is possible to visit all 7 Special Stages. A slightly modified version of Emerald Hill Zone's art is also used in Hill Top Zone, with different coloration. 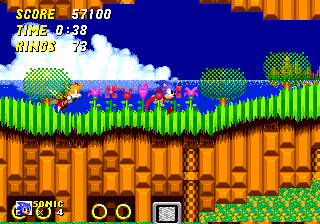 No one knows why for sure, but Hill Top Zone and Emerald Hill Zone were developed during the same time which can be proven by playing the Simon Wai prototype where they are both completed. Coconuts - Monkey enemy, throws coconuts at you from up a tree. Buzzer - Wasp enemy, flies along and stops to fire a missile at you, then continues flying. Masher - Piranha enemy, jumps vertically from inside waterfalls.